The Taipei Dome (大巨蛋, „big giant egg“), located next to Songshan Culture Park, is one of those „development“ projects that currently abound in Taipei. 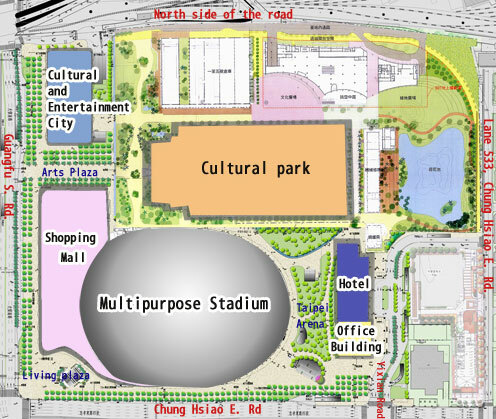 A 40.000-seat-indoor baseball stadium right across from Sun Yat Sen Memorial Hall, a shopping mall, hotels and office buildings. Business as usual. Big corporations pour lots of concrete and make a lot of money. Citizens and tourists go shopping. So what is the problem with it? 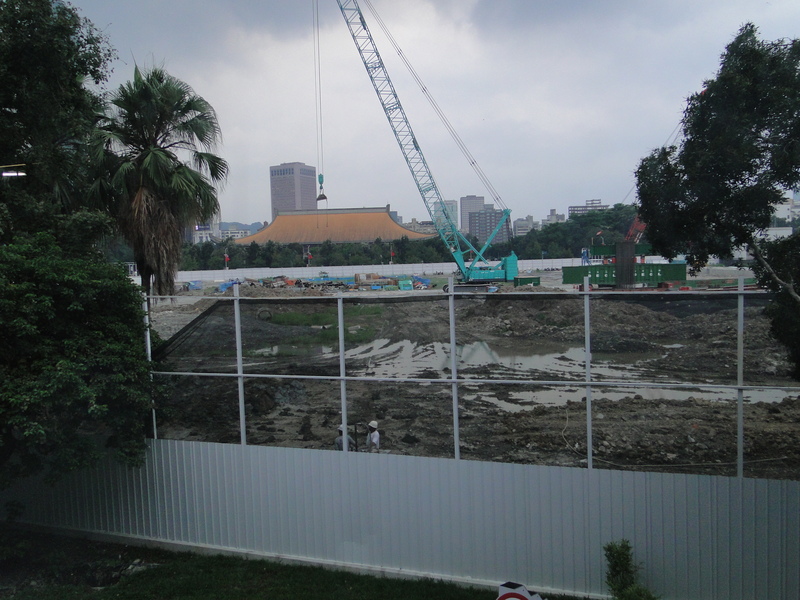 The problem, as many people see it, is that by greenlighting the construction of the Taipei Dome, the Taipei City government has thrown away the chance to establish something the city and its people really need – namely, a second inner-city forest park. 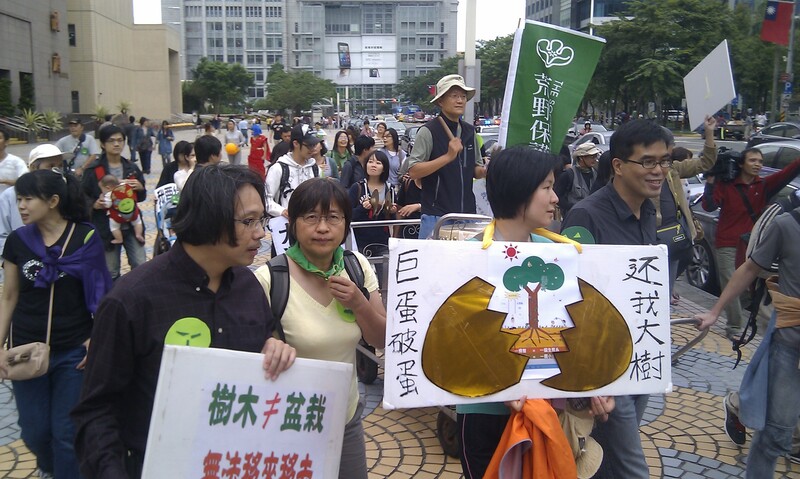 I admire all these citizen groups in Taiwan hitting the streets to protest for their cause. They are too late this time, I am afraid. Big business has succeeded again in establishing facts (chopping down trees, bringing in the big machines, digging holes) before public pressure could make politicians change their minds. 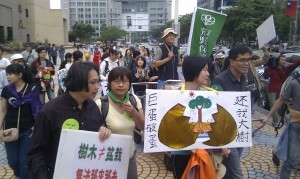 Citizens protesting against the loss of urban green spaces, 30 Oct 2011. What a great park this could have been. No one would deny that is was a stroke of genius to establish Daan Forest Park, a few kilometers away to the south-west, at the site of a former military village. But it is just one site. Another forest park, not quite as big, directly across from Sun Yat Sen Memorial Hall would really have breathed life into this part of the city. 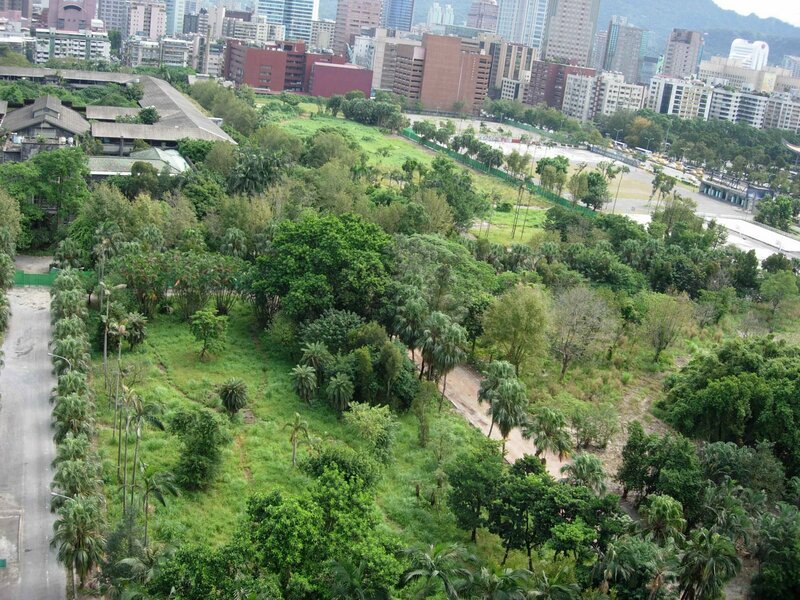 There are not a lot of green spaces left in the East District along Zhongxiao East Rd. Before: The area in 2006. 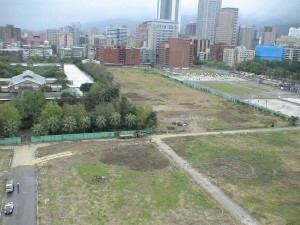 But around 2005/2006, the Taipei City Government signed a contract to turn the area over to Farglory and have them build the „Taipei Arena“ there. As a BOT (build-operate-transfer) project, Farglory would operate the project for 50 years (sacking in all the profits) and then return the area (including a by then probably derelict building) to the city. Enviromentalists and people from the area (there is a primary school next door) protested and sued. 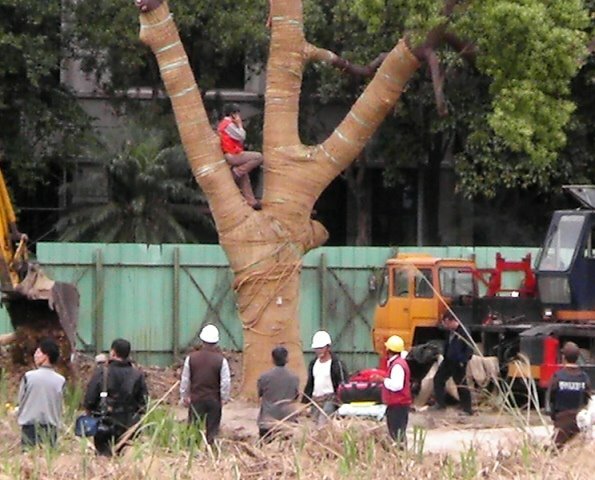 But before all rulings were final, or the project had passed all enviromental impact assessments, the City Government already started removing trees. Calvin Wen of the Green Party Taiwan tries to prevent a camphor tree tree from being cut down, 27 Feb 2009. After: The area in 2009. 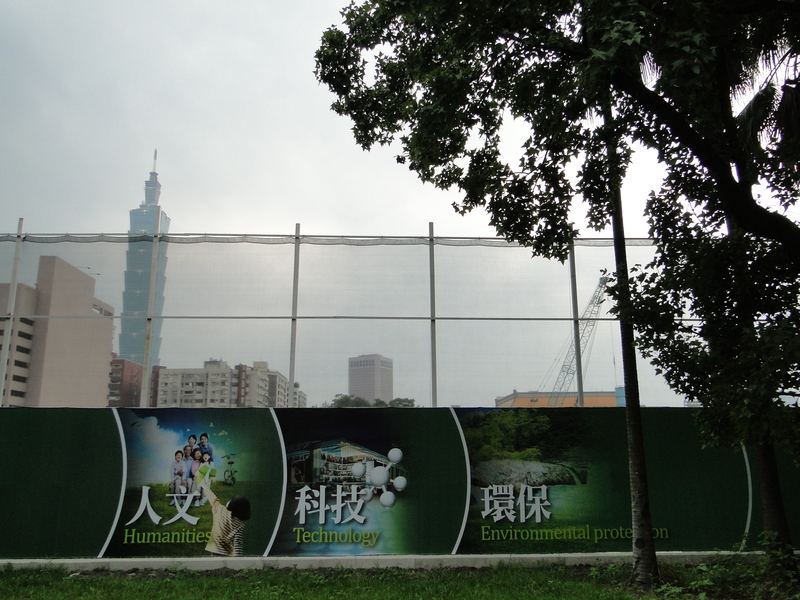 More than two years later, Taipei City’s Environmental Impact Assessment Review Committee, voting eight to five, approved the construction. The officials demanded some minor changes (like less floor space but more parking) to make it look like they actually were interested in changing anything. So now the big machines could start rolling in. 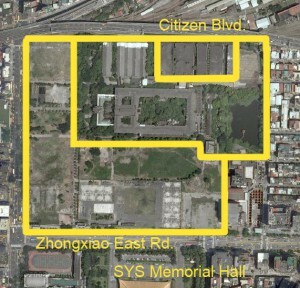 This is what the site looks like now, looking south from the old factory building towards SYS Memorial Hall. Mind you, this could have been your Forest Park. Too late: The area now. Sure, the actual Songshan Tobacco Factory Building is still there, as are some trees surrounding it and even a pond. It is a great location which the Design Expo just made good use of. But it occupies just part of the total area. After the construction has finished, this really nice spot will be squeezed in between the Taipei Dome, shopping malls etc. to the south and west, and a new high-rise hotel to the north. Instead of a park with a clear view all the way down to SYS Memorial Hall. Because huge corporations often take citizens to be complete idiots, they are even promoting this huge building made of concrete, for which hundreds of trees have been cut down, with the slogan „Enviromental Protection“. The protesters beg to differ. I am pretty sure it is too late to stop the construction of the Taipei Dome. I think the best the protesters can do is make the Taipei City Government aware that it cannot go on turning those few precious open spaces that are left in the inner city over to developers. Because cities are primarily for people to live in, not for corporations to make money at everyone’s expense. Next could be the greenland behind Huashan 1914 Culture Park, stretching south of Citizen Boulevard and westward to Linsen Rd. After the railroad tracks were moved underground, this huge area became „available“. The central government has already decided to build a „Service Center“ at the western end, where there is currently an art installation. I am pretty sure those are not the only plans. 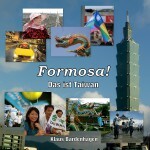 Read more English Taiwan posts on this otherwise mostly German blog. Interesting? Using Flattr, you can support content you like by donating a few cents. I’m kinda split on this one. Taipei definitely needs more parks, that’s for sure, but we also need more shopping and business centers. It’s just so crowded everywhere you go, especially in the Main Station area and around City Hall and it would help to direct the crowds to some other parts of the city as well. 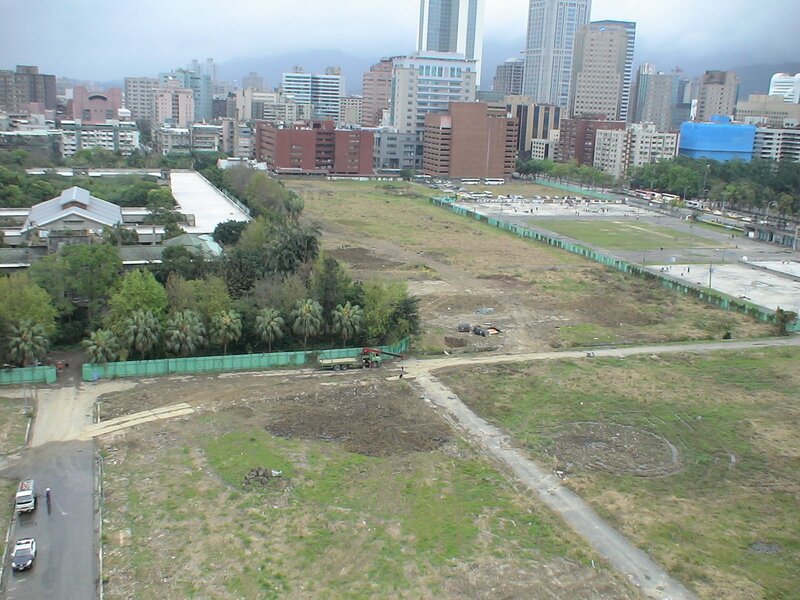 I don’t see this small piece of land fixing the problem of green spaces in Taipei, but it speaks volumes about how big the problem is, if people feel the urge to protest (and I completely support their freedom of doing so). I don’t know of any real solutions for both problems. Overpopulation, a severe centralization and an insufficient infrastructure are causing Taipei’s problems of today in regards to both issues. If more political and economic power would be given to other parts of Taiwan and if infrastructure would be improved, we might get hope that Taipeiers can enjoy a better quality of life. But what can you do, if Taipei is the only city in Taiwan where you can earn a decent buck? Everybody wants to live and work here (including me). If me and my wife got the same pay in Kaohsiung, we’d be there in no time. Respectfully, I disagree in every possible way. What people in Taipei need is to get their priorities straight. Also, I do not see that as a „small“ piece of land. It is almost as big as Daan Park. I understand the attraction Kaohsiung has towards Taipei dwellers. 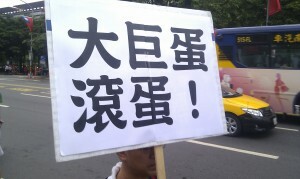 Keep in mind, with the rents and cost of living there, you do not even need to earn as much as in Taipei. Klaus, your view is a German one. Taiwanese people like to „sanbu“ in a department store, so a German park would be a Taiwanese shopping mall. So there is definitely a need for another shopping area. Well, I did not see many other Germans during that demonstration. I have had fears for the Culture Park before – the area is vast, and while sometimes a very noisy spot (the Shimin elevated highway!) it provides Europeans with a sense of history – old leftover tracks are still there somewhere to be discovered, you can see the reasons for moving them underground from the map. The old factories in the Eastern bit have a sense of tranquility left which I enjoy every time. But maybe thats just me. I totally disagree with this opinion. 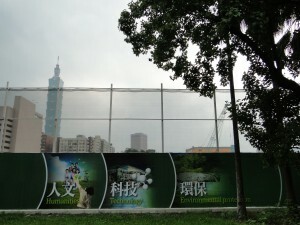 I’m a Taiwanese and I love „Green“ as well. Ok, it seems you are a minority. For Taiwanese, It’s just nicer to walk in a dry space like a shopping mall than in a often rainy park. And for most people it’s just about looking, not buying. Most people go anyway into the food court which seems the most important area. Which park has a dry food court?? „I totally disagree with this opinion. Oh Mann, wer baut den heute noch ein Stadion mitten im Stadtzentrum. Viel Spass beim parken. Wenigstens gibt es einen direkten U-Bahn-Anschluss.